Ovakim Martirosyan and his wife both hail from Armenia, and now run a tiny kabob house on a Glendale side street that offers only three tables. They tend to a long and lean stovetop grill which holds kabobs, tomatoes and peppers. 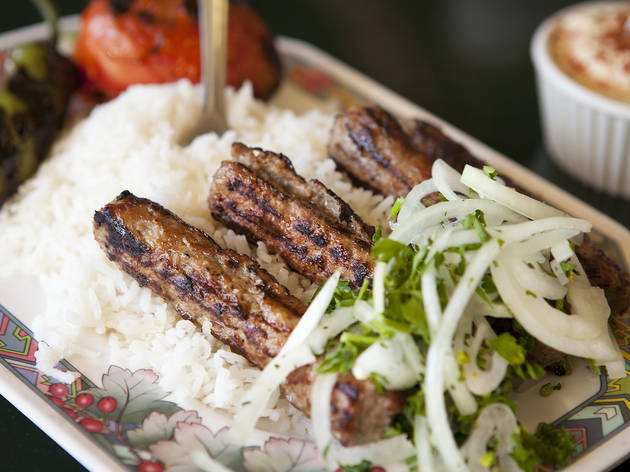 The Mini Kabob Plate ($9.95) features small luleh kebabs crafted in-house with either beef chuck or chicken thigh plus salt, pepper, onion and a special "green plant" that Martirosyan refuses to reveal. Each plate comes with rice, blistered tomato, spicy jalapeño, onion, parsley and sumac salad; a basket of lavash; and a tiny ramekin of garlicky, Aleppo pepper dusted hummus. I had high expectations for this place with the glowing reviews online. 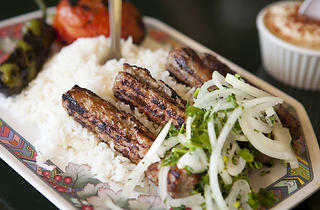 I ordered the combo platter as well as a side of the mini kabob. The meat was quite tender, but lacked flavor. I had to use a lot of the garlic sauce which tasted similar to Zankou's garlic sauce. The hospitality was also lacking. I ordered through Grubhub and the owner admonished me about it. She said next time I should just call directly because Grubhub charges them a fee. At this point, I haven't even received my food. Furthermore, when I asked for more garlic sauce, she said it would be an extra 75 cents for a very tiny serving. I did not feel welcome at this restaurant. If it's about food we're talking about, this is #1. So if you don't like their dining room, just take it to go :) I love their dining room though, it's like my grandma's and I like their company when I eat, so I just can't stop going back. A small, friendly, family owned eatablishment that makes fresh, incredibly quality food. They never EVER disappoint. Hands down my favorite spot to eat in LA right now. Family owned and operated and they put a ton of love into their food. Everything is always fresh and delicious and these folks are super friendly. Anyone who's been here knows that it is a hidden gem in LA. Amazing food! Must try hummus, chicken, eggplant cavier, all around just great food.